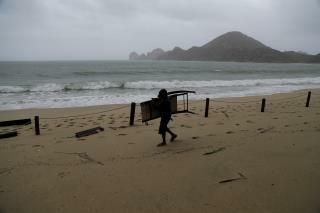 (Newser) – Hurricane Newton swept onto the Gulf of California after slamming the resorts of Southern Baja Tuesday and headed on a path expected to take it to the Mexican mainland by Wednesday morning and then on to the US border, with potentially dangerous rains for Arizona and New Mexico, the AP reports. Newton came ashore near the Los Cabos resorts Tuesday morning as a Category 1 hurricane with winds of 90mph pelting the area with torrential rain as residents sheltered at home and tourists huddled in hotels. A shrimp boat capsized in rough seas in the Gulf of California, killing two people and leaving three others missing, authorities say. It's wonderful when this happens. Life renews in the dessert. Dormant species pop out of the sand and get busy with it, and flowers bloom that have waited since the last floods. The desserts team with life as the cycle repeats. Soon the water is gone and the job is done. I remember when we had a bad drought in my area and one of these came from Texas and flooded us out. But nothing was greater than our very first recorded hurricane in Oklahoma. That filled all of our lakes and saved a summer at my own rec facility.